Dalmau, R.; Melgosa, M.; Prats, X. The base of aircraft data (BADA) model provides accurate modelling of aircraft performances over the complete flight envelope for flight simulation and prediction applications. BADA is based on a generic total energy model, which performance functions (e.g., drag, maximum and minimum thrust, fuel flow) are particularised for each aircraft type with coefficients included in the BADA databases. BADA has a high reputation within the academic and research world, thus it is widely used for air traffic management research applications. This poster presents the architecture and capabilities of pyBada, a Python-based software designed for the easy integration of the BADA model in trajectory simulation, prediction and optimisation applications. 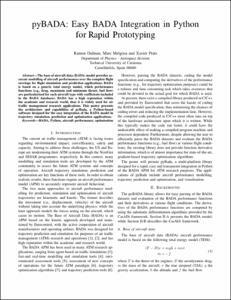 Dalmau, R., Melgosa, M., Prats, X. pyBADA: Easy BADA integration in Python for rapid prototyping. A: SESAR Innovation Days 2018. "8th SESAR Innovation Days". 2018, p. 16-17. BADA, Python, aircraft performance, optimisation.